Cleaning Toilet Makes You Rich!? 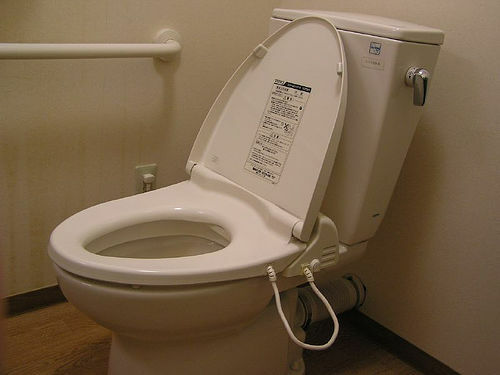 In Japan, some people believe that cleaning toilet is good luck especially with money. It is a famous story that a film director, Takeshi Kitano has cleaned toilet since he was young. The belief came from Feng Shui but it is not just a superstitious thing. The average annual income of the cleaning people is 5.4 million yen, which is 0.9 million more than non-cleaning people whose average is 4.5 million yen (100yen=US$1.20). To the question “Do you think that you are beautiful?” 28% of women in cleaning group said yes, and 14% of women in non-cleaning group said yes. While average of 7.4 men declared love to the cleaning women in the past, 4.8 men did to the non-cleaning women. At the end of last year, Japan Style introduced a big hit popular song, “Toire no Kamisama (God of Toilet)” sung by Kana Uemura (read the article). It is about the singer’s deceased grand mother’s teaching “There is a beautiful beautiful goddess in the toilet. That’s why if you clean the toilet everyday. You can become beautiful like the goddess.” What her grand mother said must be true. Lion Corporation concluded that those who clean toilets are good at making arrangements and have many friends; therefore, their work and social skill are highly evaluated.